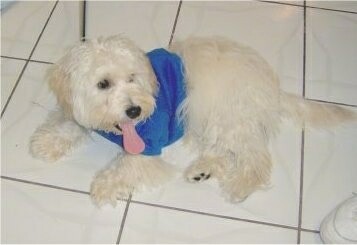 Mega the Westipoo at 9 months old—"Mother was a 17-lb. 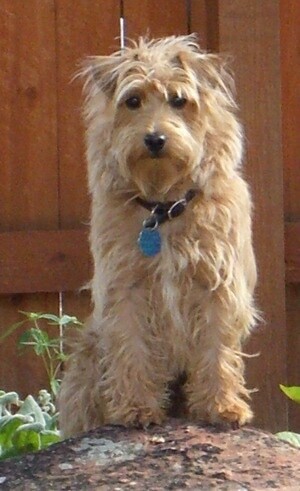 West Highland Terrier; father was a 7-pound Toy Poodle. She weighs in at 13 pounds." The Westiepoo is not a purebred dog. 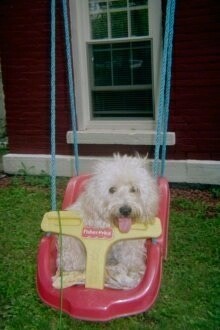 It is a cross between the Westie and the Poodle. The best way to determine the temperament of a mixed breed is to look up all breeds in the cross and know you can get any combination of any of the characteristics found in either breed. Not all of these designer hybrid dogs being bred are 50% purebred to 50% purebred. It is very common for breeders to breed multi-generation crosses. 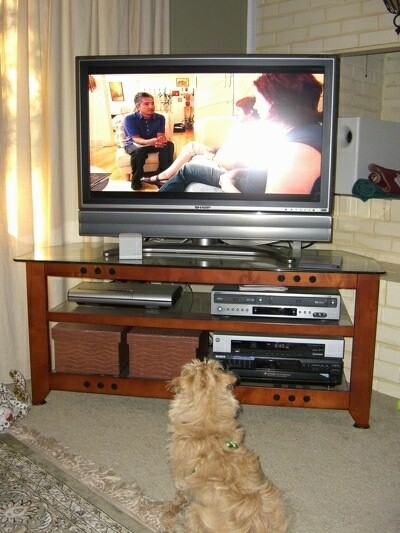 Mega the Westipoo puppy at 6 months old—"Yes, we watch the Dog Whisperer together! Bought all 3 seasons on DVD. Learn something new every time. Mega is a very friendly, loving pooch. Not fearful, but clearly not aggressive. When approaching another dog, within a count of 3, she is on her back as if to say, “I’m not in charge here, I’m not challenging anyone; you’re the boss”—just like Cesar says in his book!! Housebreaking was a bit difficult—but all was good in about 3 months. Very cute, funny and attuned to daily to rituals." Dollie the Westiepoo at 9 months old—"She is very sweet and smart. 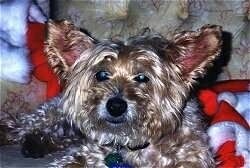 Her mother was a West Highland Terrier and her father was a Toy Poodle. She loves, loves, loves people, especially kids!!!" 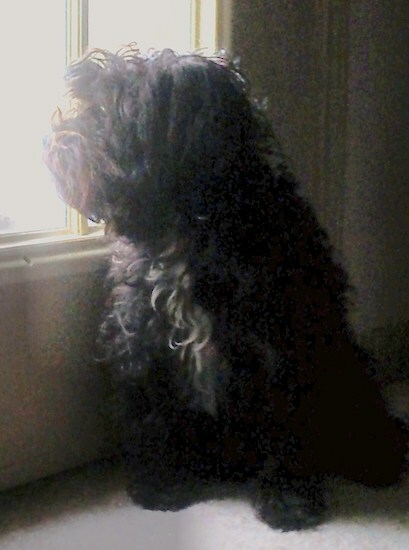 "Madeleine is a 2.5-year-old West Highland Terrier / Poodle mix. She was purchased at 5 months old and has been the best dog I've ever had. She can be playful and hyper, but most of the time she is lazy and wants to just lie and cuddle with me. =) She was easily trained and I love the fact that she doesn't shed. She's solid black with a small white patch on her chest. She likes long walks and nibbling anything that happens to fall on the kitchen floor!" 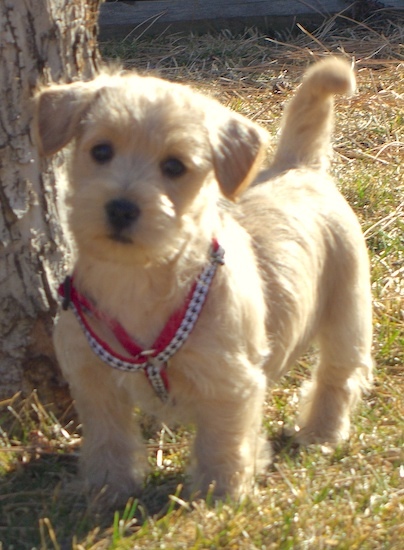 "Deogi is a West Highland Terrier / parti Poodle mix. We bought him through an ad in our local paper. Pretty darn smart, but doesn't much like being held. So much for my lap dog. We have 19 grandchildren, so it was very important that whatever we got, it had to be good with them. He has both been great with all from 20 years right down to newborns." 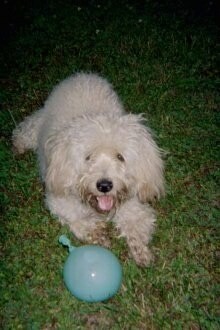 Peppy Lepew the Westiepoo at 9 months old with a water balloon. "Give me that balloon before you eat it!"